With the RealBird Listing Publisher, you enter your listing once - and a wide variety of automated, semi-automated and manual options are immediately available to maximize your real estate marketing exposure. The listing syndication module automatically distributes your "for sale" and "for rent" properties to leading real estate search portals. 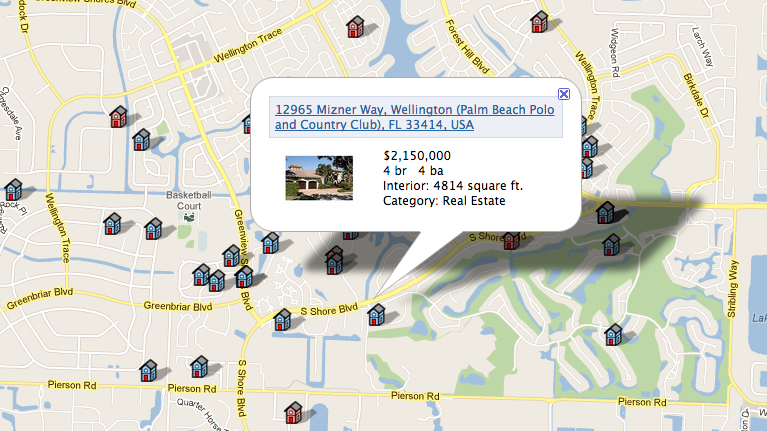 Start syndicating your listings in as little as a few minutes. But there is more: One of RealBird's syndication partners is Oodle, which is also the back-end database for the private labeled RealBird Property Search. 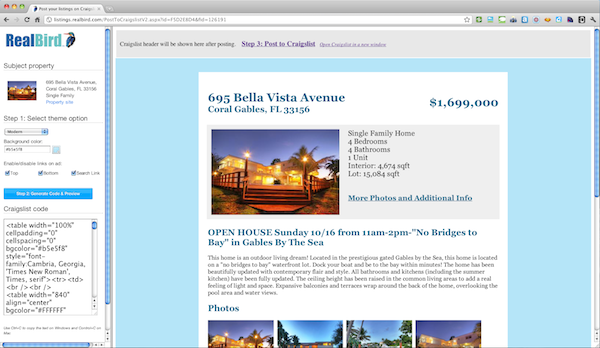 The RealBird Property Search search engine is used by thousands of RealBird member agents and brokers all over the USA, Canada and the UK: Every time your listings are syndicated to Oodle, those listings will also show up in search results on all real estate websites, mobile sites and Facebook Real Estate Pages that utilize RealBird as a real estate search engine. Pretty cool, isn't? 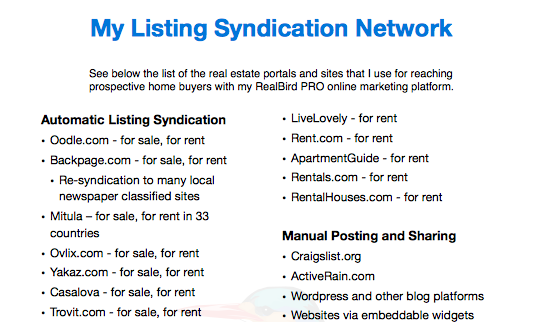 Some of the biggest 3rd party referral sources do not accept automatic listing syndication, but with RealBird, you can generate optimized and beautiful listing embed codes with only a few clicks You can use these codes to promote your RealBird listings on Craigslist, your ActiveRain, Localism, Wordpress and other blogs to name just a few. Additionally, easy social media sharing is also provided both via the listing management member area and on your single property websites.